What if joy were possibleright where you are? Inspiring hundreds of thousands of readers to wake to their own wondrous lives, the New York Times Bestseller, One Thousand Gifts: A Dare to Live Fully Right Where You Are, shares the journey of one woman facing her own hard, dark days and hidden fears, and stumbling straight into the answer of life's great riddle: How do you discover joyright here and now? Selections from One Thousand Gifts features powerful, life-changing passages from Voskamp's compelling story and her own exquisite photography, framing a seemingly ordinary, gritty life around true amazing grace. Because if joy is a matter of gratitude, and gratitude is a matter of perspective, then giving thanks changes not only your perspective, but also changes your life. Open these lyrical pages and slow down to discover the joy you've always been looking for. Come find God in the moments! 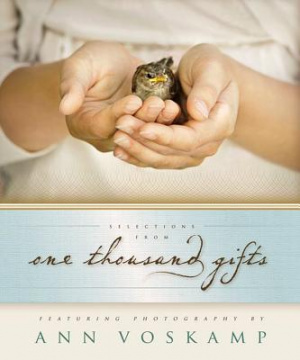 Selections From One Thousand Gifts by Ann Voskamp was published by Zondervan in March 2012 and is our 25314th best seller. The ISBN for Selections From One Thousand Gifts is 9780310313540. Be the first to review Selections From One Thousand Gifts! Got a question? No problem! Just click here to ask us about Selections From One Thousand Gifts.